I love berries. Love them. I haven’t met a berry I didn’t like. I will EAT ALL THE BERRIES! And sometimes…I do. Thanks to my good friend, Harry, I have a nice supply of freshly picked blueberries. And I really wanted to make the most of them. So, over the weekend, while doing some meal prep, I decided to do some baking…utilizing some of the blueberries. Lucky for me, this month’s Vegetarian Times was featuring blueberries in their “One Food Five Ways” feature. SCORE! And the one recipe that really stuck out to me was the Blueberry and Dark Chocolate Scones. So…that’s what I made…for breakfast at the office on my gym mornings. It just will involve some reheating. 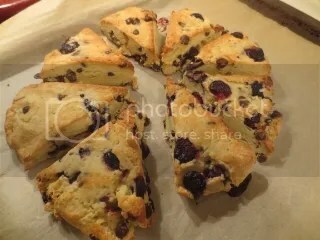 And since I love scones, this seemed like a great recipe to attempt. The only difference is my version had to be gluten-free. So, I crossed my fingers and said a prayer to my gluten-free baking gods that this recipe might like my gluten-free all-purpose flour. These pastries are so simple to make and don’t take a lot of time. They bake up beautifully and look amazing. Oh…and you might want to eat them the moment they come out of the oven because they make your home smell SO good! Sift together flour, sugar, baking powder, and salt in a large bowl. Work in the butter using your fingertips or a pastry cutter, until only small crumbs remain in the mixture. Whisk together milk, egg yolks, and vanilla in a medium bowl. Add the dry ingredients to the wet, and mix just until incorporated (the mixture will be crumbly). Gently stir in the chocolate chips and blueberries. Gather dough into a ball. Transfer the dough to a floured work surface, and press into a 3/4-inch-thick disk. Dust a knife with flour, then cut dough into 8 equal wedges. Transfer to prepared baking sheet, and brush tops lightly with milk. Bake for 18-20 minutes, or until lightly browned on top and bottom. This recipe embodies everything that is amazing and wonderful in this world. Fresh blueberries. Dark chocolate. Breakfast. These scones are a fantastic treat in the morning…and actually not too bad as far as nutrition goes…for scones. I loved the flavor of the bittersweet chocolate with the burst of sweetness from the blueberries. Harmony in breakfast form. I will be making these again…that’s for sure! Simple recipe…simple breakfast pleasure. This entry was posted in Baked Goods, Breakfast, Chocolate, Dessert, Dough, Entree, Food, Fruit, Gluten-Free, Recipe, Snacks, Sweet Stuff, Vegetarian by The Celiathlete. Bookmark the permalink.